Create a luxuriously soft and comfortable sleep environment with our Coma Inducer Queen Duvet Cover - Baby Bird - Smoke Blue. Create a luxuriously soft and comfortable sleep environment with our Coma Inducer Queen Duvet Cover - Baby Bird - Glacier Gray. Create a luxuriously soft and comfortable sleep environment with our Coma Inducer Queen Duvet Cover - Me Sooo Comfy - Alloy. 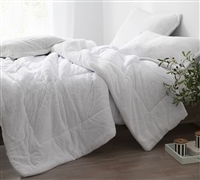 Create a luxuriously soft and comfortable sleep environment with our Coma Inducer Queen Duvet Cover - Me Sooo Comfy - Hint of Mint. Create a luxuriously soft and comfortable sleep environment with our Coma Inducer Queen Duvet Cover - The Napper - Limelight Yellow. Create a luxuriously soft and comfortable sleep environment with our Coma Inducer Queen Duvet Cover - The Napper - Jet Stream. Create a luxuriously soft and comfortable sleep environment with our Coma Inducer Queen Duvet Cover - Frosted - Rose Quartz. Create a luxuriously soft and comfortable sleep environment with our Coma Inducer Queen Duvet Cover - Baby Bird - Mimosa. Create a luxuriously soft and comfortable sleep environment with our Coma Inducer Queen Duvet Cover - Frosted - Queen. Create a luxuriously soft and comfortable sleep environment with our Coma Inducer Queen Duvet Cover - Touchy Feely - Aruba. Create a luxuriously soft and comfortable sleep environment with our Coma Inducer Queen Duvet Cover - UB-Jealy - Slate Black. Create a luxuriously soft and comfortable sleep environment with our Coma Inducer Queen Duvet Cover - The Original Plush - White. Create a luxuriously soft and comfortable sleep environment with our Coma Inducer Queen Duvet Cover - The Original Plush - Almond Milk. Add luxurious, plush comfort to your Queen Bedding with our Coma Inducer Queen Comforter - Oversized Queen XL Bedding - Arctic Fox - Tundra Gray. Add luxurious, plush comfort to your Queen Bedding with our Coma Inducer Queen Comforter - Oversized Queen XL Bedding - Velvet Crush - Champagne Pink. Add luxurious, plush comfort to your Queen Bedding with our Coma Inducer Queen Comforter - Oversized Queen XL Bedding - Baby Bird - Mimosa. Add luxurious, plush comfort to your Queen Bedding with our Coma Inducer Queen Comforter - Oversized Queen XL Bedding - Touchy Feely - Aruba. Add luxurious, plush comfort to your Queen Bedding with our Coma Inducer Oversized Queen Comforter - UB-Jealy - Nightfall Navy. Add luxurious, plush comfort to your Queen Bedding with our Coma Inducer Oversized Queen Comforter - Me Sooo Comfy - Alloy. Add luxurious, plush comfort to your Queen Bedding with our Coma Inducer Oversized Queen Comforter - The Napper - Limelight Yellow. Add luxurious, plush comfort to your Queen Bedding with our Coma Inducer Queen Comforter - Oversized Queen XL Bedding - The Original Plush - Almond Milk. Add luxurious, plush comfort to your Queen Bedding with our Coma Inducer Queen Comforter - Oversized Queen XL Bedding - The Original Plush - White. Add luxurious, plush comfort to your Queen Bedding with our Coma Inducer Queen Comforter in Charcoal. Add luxurious, plush comfort to your Queen Bedding with our Coma Inducer Queen Comforter - Oversized Queen XL Bedding - Frosted - Black.